We know there’s been a lot of bad news on climate change lately. But there is plenty of good news too, and we think it’s just as urgent that people hear the good that is happening around the globe. 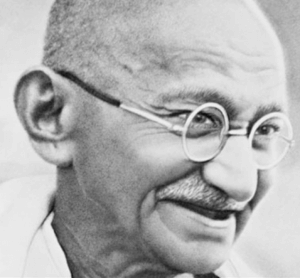 Recognizing the progress the world has made keeps us hopeful and avoids the feeling of helplessness that can stop us from moving forward and taking action. So Climate Interactive has been gathering reasons to be hopeful about the climate. A citizens’ climate movement is awakening in the United States. After President Trump withdrew from the Paris Climate Agreement, dozens of US states and hundreds of cities, counties, tribes, museums, and universities committed themselves to Paris-level emissions reductions. 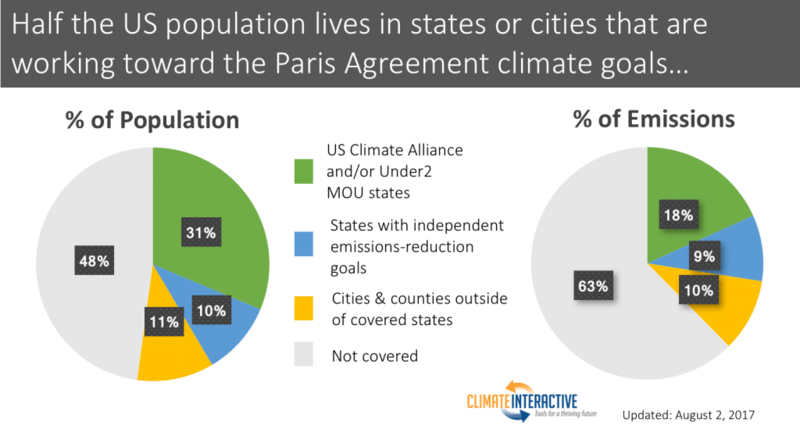 More than half of the US population now lives in an area that is committed to reducing emissions in line with the Paris Agreement goals. Every week the number of commitments grows, and brings the US closer to its Paris Agreement emissions reductions target. There is also support for climate action in the US federal government – and what’s more, it’s bipartisan. The Climate Solutions Caucus of the US House of Representatives was created in 2016. Composed of an equal number of Democrats and Republicans, the caucus crafts bipartisan legislation dealing with the causes and impacts of climate change. The caucus itself was formed after a long lobbying effort from the Citizens’ Climate Lobby, showing the power of citizen efforts to raise political awareness of climate change. In order to keep global warming below 2°C, carbon emissions need to peak, and peak soon. And there is evidence that this is already happening. 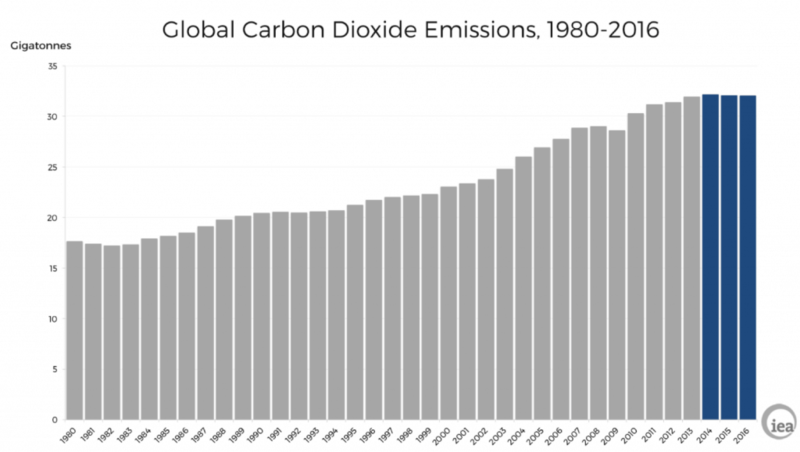 According to the International Energy Agency, global carbon dioxide emissions have remained flat for the past three years, even as the global economy grew. This shows that the world economy is beginning to decarbonize. But while this is a good sign, we must ensure that this is a true peak rather than a pause, and start working to decrease those emissions. Forty countries and 24 cities, states, and regions are putting a price on carbon, according to the World Bank. And the carbon price movement is growing – the share of global emissions covered by a carbon price has tripled in the past ten years. Seven out of the 10 largest global economies have now put a price on carbon. 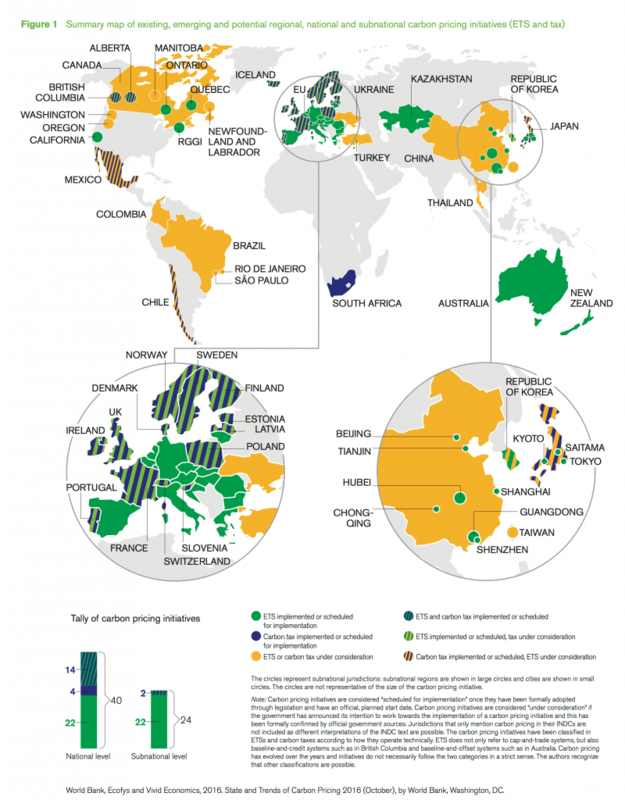 What’s more, the World Bank reports that a rapidly growing number of companies have begun to use internal carbon pricing in the past year, and more international platforms have been introduced to encourage the uptake of carbon prices around the world. 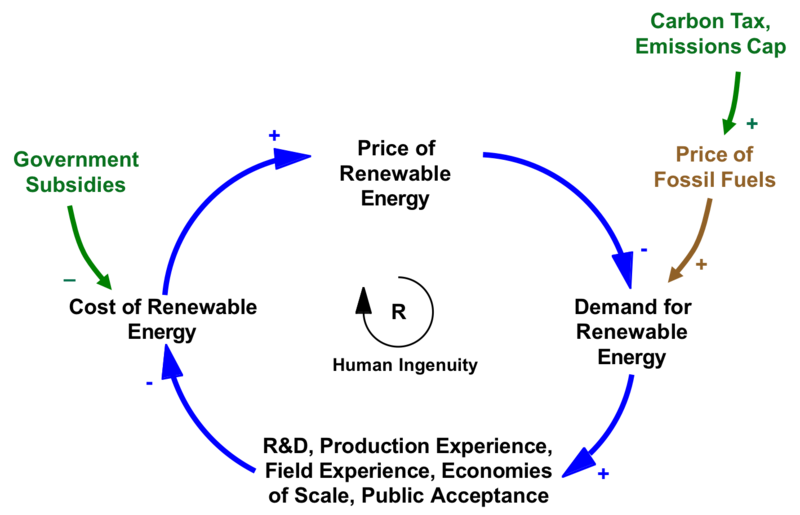 There is a feedback loop for renewable energy production: as demand for renewable energy goes up, R&D, economies of scale, and public acceptance of renewable energy technologies all rise. 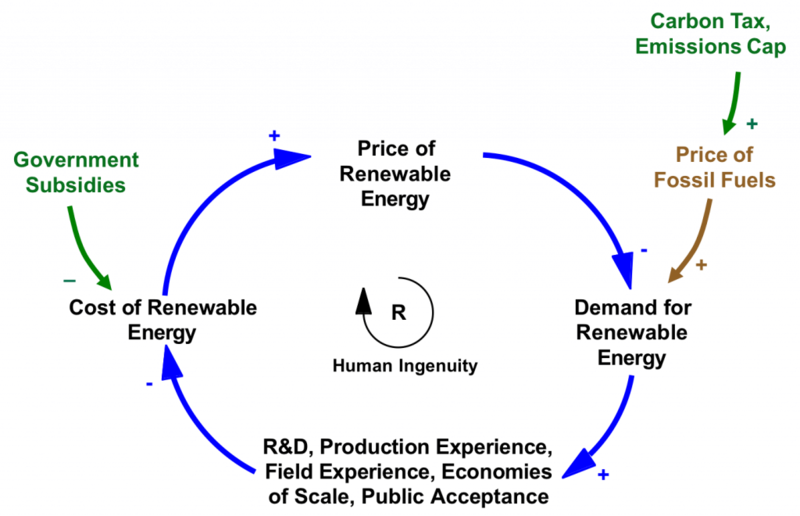 This brings the cost of producing renewable energy down, which in turn reduces the price of renewable energy. 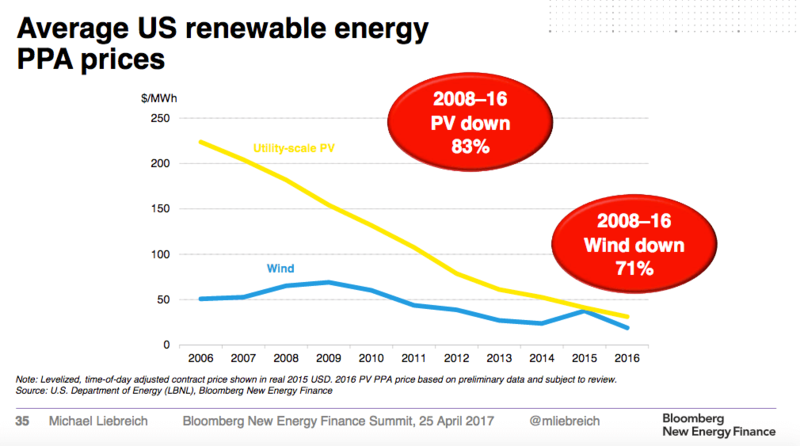 This price drop continues the cycle, as demand for renewables rises when the price goes down, and yet more renewable energy is diffused. The good news is that this virtuous cycle is well under way, as seen by the incredible drops in the cost of wind and solar technology in the past several years. In fact, Bloomberg predicts that solar power will become the cheapest energy source almost everywhere in the world within the next ten years. The market is driving these changes, but with the implementation of clean energy subsidies and/or carbon pricing, this cycle will accelerate even further. China is the world’s biggest producer and consumer of coal, but it may be turning a corner. 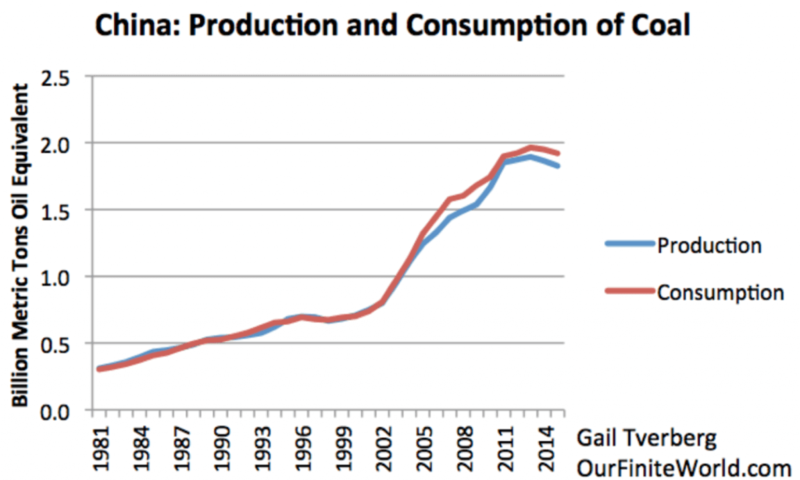 Although Chinese coal production and consumption rose hugely during the 2000s, it appears to have peaked in the 2010s and is now beginning to decline. Along with this change, China’s renewable energy sector is flourishing, growing faster than its fossil fuel and nuclear power capacity. The Paris Agreement, adopted in December 2015, was an important breakthrough in the international negotiations on climate change. Despite President Trump’s recent high-profile exit from the Agreement, it continues to provide a powerful framework for 194 countries in the world to work together to set and address climate goals. 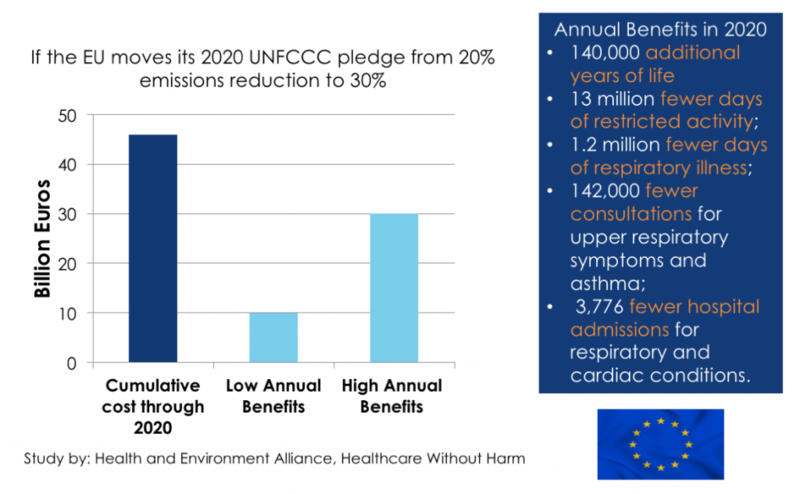 While the current emissions pledges in the Agreement do not limit us to 2°C of warming, with increased action to reduce fossil fuel emissions, the participating countries could set the world on a path to 2°C or lower. As if climate change alone wasn’t enough reason to stop burning fossil fuels, we are finding out more about the ways that preventing climate change can also bring about economic, health, and other co-benefits. For example, planting a tree sequesters carbon emissions, which helps reduce climate change. But that tree will also clean the air and soil around it, provide cooling shade in the summer, and reduce the noise of city life. Another example: designing a neighborhood to be walkable will reduce the number of cars on the road, but it will also increase the health of residents and help those who can’t afford a car. 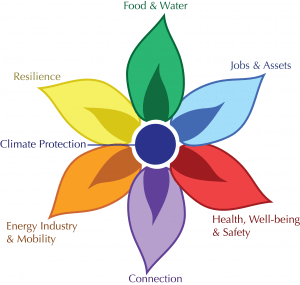 We call these intersections of climate, justice, and well-being multisolving, and it is encouraging to see that so many problems can be addressed with the same budget and intervention. Also, when we keep these connections in mind, we can forge alliances with groups fighting for better healthcare, for social justice, and for many other causes. In short, we are realizing that acting on climate pays dividends. How long does it take to accomplish long-term change? In the US, Bloomberg found there’s a pattern: a few pioneers will get out ahead of the issue, and then years or decades later a key event (such as a landmark court case or the maturation of a grassroots campaign) will take place that ushers in a cascade of new supporters, and finally a federal law on the issue. What’s more, the pace of social change seems to be accelerating: it took centuries for interracial marriage to go from being acceptable in a few US states to becoming federal law, whereas gay marriage took a little more than a decade to make the same transition. These booms that bring about change often seem unpredictable, even on the cusp of such an event. The world ended the slave trade in the 19th century and apartheid in the 20th. If we keep up the pressure, then climate change could be the next frontier for global change. Beginning as a movement in 2011, young people on campuses across the US were determined that their college or university should not be putting money into fossil fuels, and urged their schools to divest their endowments away from fossil fuel companies. Today, 668 institutions around the world have joined the divestment movement, representing governments, NGOs, faith-based organizations, educational institutions, and more. 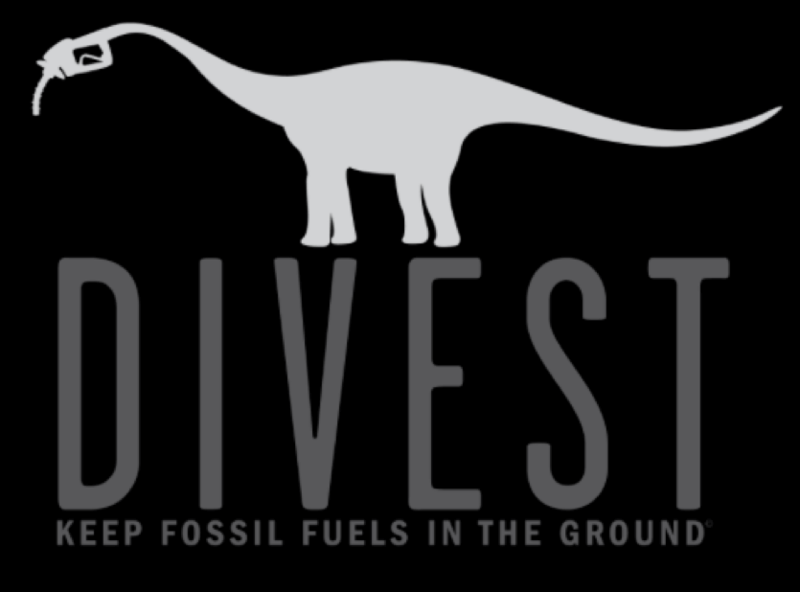 The Guardian reports that this has been the fastest-growing divestment movement in history, and almost $5.5 trillion in global assets has been divested thus far. 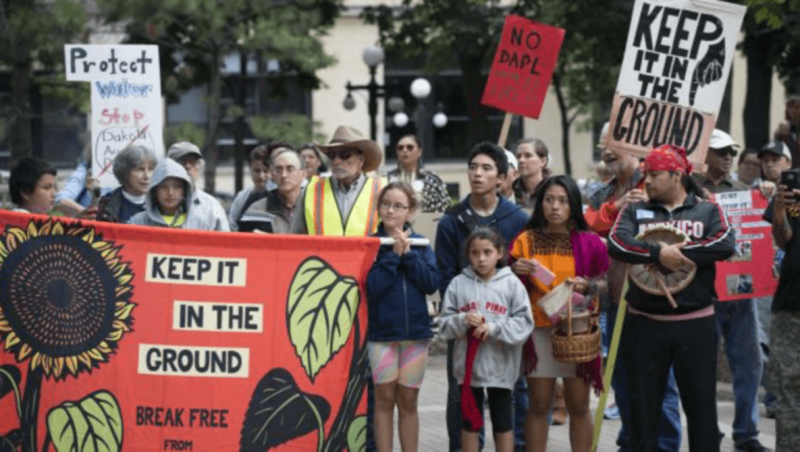 In early 2016 in the midwestern United States, a diverse coalition of Native American tribes began to protest the construction of the Dakota Access underground oil pipeline that was an impending threat to their water supply and sacred sites. The protests escalated over a period of months, and the original protesters were joined in support by 87 Native American governments, Black Lives Matter supporters, indigenous leaders in South America, and other civil rights and environmental groups. After several twists, turns, victories, and setbacks, the pipeline became operational in June 2017. However, a federal judge has ruled that the permit authorizing the pipeline violated the law, and the Standing Rock Sioux tribe has filed a brief to ask for the pipeline to be shut down while a more thorough environmental review is conducted. This incredible protest showed the power of a grassroots movement led by Native Americans and those most vulnerable to fossil fuel exploitation. It showed that we can pull together and make common cause with diverse coalitions to protect indigenous sovereignty and land rights while working to keep fossil fuels in the ground. To keep the momentum going, we must continue to reach across traditional boundaries and build support to make a better world for all. If there’s anything that these signs of hope show, it’s that we can do it. It may take a strong, coordinated, and global effort to keep fossil fuels in the ground and spread renewable energy, but we can do it. We know what it takes to reduce climate change, and we know that we must move forward together. Think about your role in this effort – seeing all these reasons for hope, all of these effective strategies, what part could you play? Could you ask your organization to divest from fossil fuels, or pressure your elected officials for a carbon price, or add to the demand for renewable energy, or join a coalition like the Standing Rock activists? It’s not going to be easy. It’s going to be worth it.